As the sun sets and the walls of the houses, churches and palaces turn mauve is when we can best enjoy the silence, magic and romanticism that floods Toledo´s hidden neighbourhoods. Let yourself get lost in streets where time stands still on some of its corners filled with legends, romances and curiosities. This neighbourhood is, without a doubt, the most beautiful in the Old Quarter. 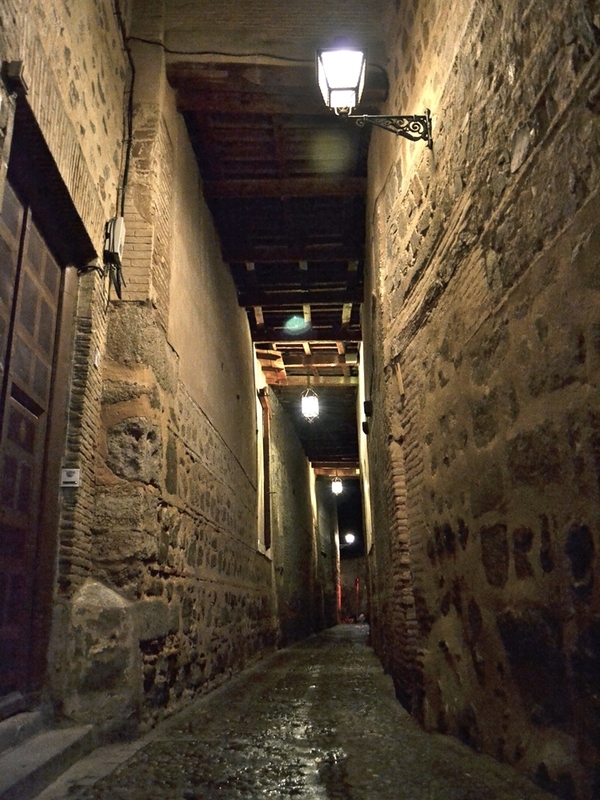 Ancient convents, sheds (cobertizos), medieval legends and streets are around every corner and make this route oneof the most unforgettable experiences in Toledo at any time of the day, but especially at night. It is also known as the “romantic district”, as it was frequented on countless occasions by Gustavo Adolfo Bécquer, Zorrilla, or Dalí and Buñuel, among others. Nightfall transforms the Jewish Quarter into a place full of mystery, magic, legends, and forgotten streets. Recovering the history of the Sephardic Jews in Toledo through its alleys, adarves (patrol paths), and lookout points, this is one of the best walks to take once the sun has set. At this time of night we can also visit some interior spaces, such as the Baths of El Ángel which are situated underneath a private home, making the route that much more interesting. We will walk through the mudéjar neighbourhoods to follow the steps of the Order of the Temple and its remnants such as the San Miguel Church and the Casa del Temple, the ancient hospital of the Order´spilgrims. The most attractive aspect of this route is the possibility to visit the caves where, as tradition has it, the Templars held their secret meetings. From here, we will wander around the alleys and streets filled with legends and history, ending in the heart of the city. Duration: The walking tour will last around 2 hours. Panoramic: For those groups coming to Toledo with their own bus, the visit will include a panoramic tour to enjoy the wonderful views from the other side of the Tagus river. Regarding those individuals coming from Madrid by high speed train (AVE), the panoramic tour could be made by taxi (10 euros aprox.) from the Toledo Train Station. Monuments: Every monument included in the tour will be thoroughly explained by the guide. Contents: Even though the walking tour has a common thread (The Three Cultures, El Greco, the Jewish Quarter,…) I will make alussion to every simple and important aspect of the city: handycrafts, cultural heritage, evolution of the old town, festivities, etc.